Boat rides, whales and wind! The Delaware II returned to Woods Hole Thursday, December 8, blown in by a nor’easter that moved rapidly through the area. Overall we have had a very successful cruise. We collected 71 bongo samples, 46 IKMT samples, 9 neuston samples, lots of images from the VPR, rescued one buoy, and collected our target species with multiple gears in multiple regions. 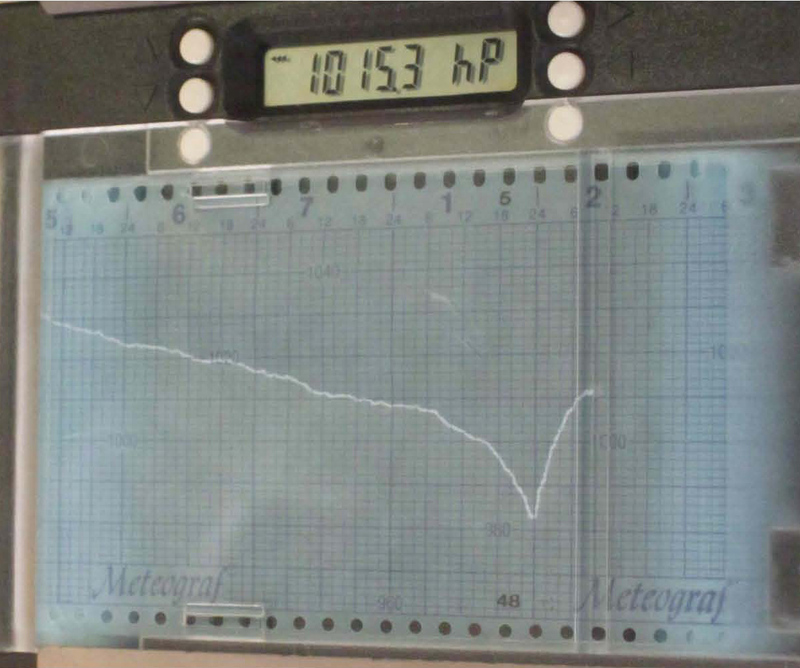 Barometer on the ship's bridge shows pressure drop caused by the nor'easter that passed around midnight Thursday, December 8. I want to thank the officers and crew of the Delaware II who worked hard to make sure we efficiently used our time to accomplish our missions. During this cruise we have been using primarily three types of gear to collect plankton samples: a 61-cm bongo net, 1.8-m Isaacs-Kidd midwater trawl (IKMT), and a Video Plankton Recorder (VPR). The bongo and IKMT are pulled through the water and plankton is concentrated at the tail end of the net, also called the cod end. 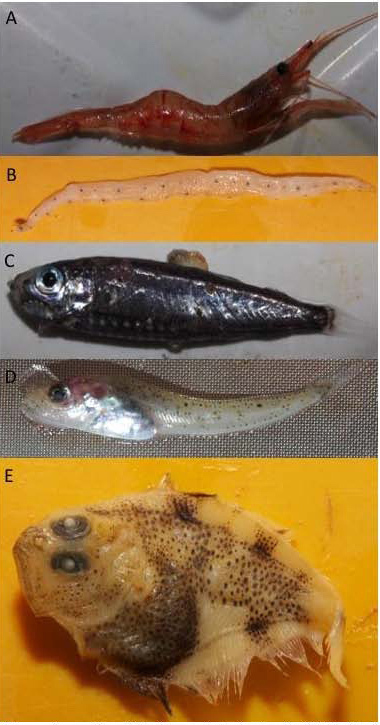 Due to different mouth opening and mesh size, bongo and IKMT collect different amounts of plankton, different types of plankton, and different sizes of plankton from the same station. The bongo has a smaller mouth opening and finer mesh than the IKMT, and generally catches smaller zooplankton and fish larvae. 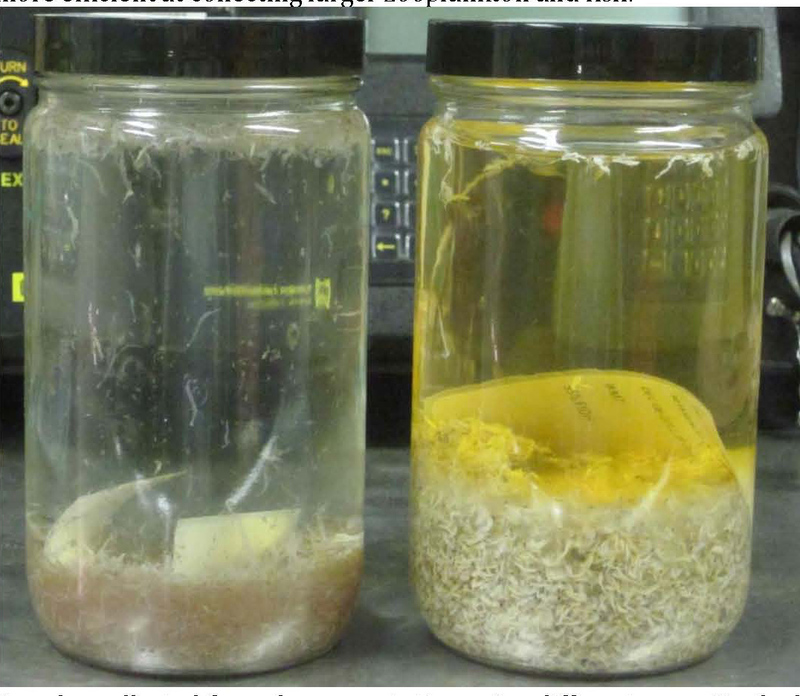 The IKMT is more efficient at collecting larger zooplankton and fish. 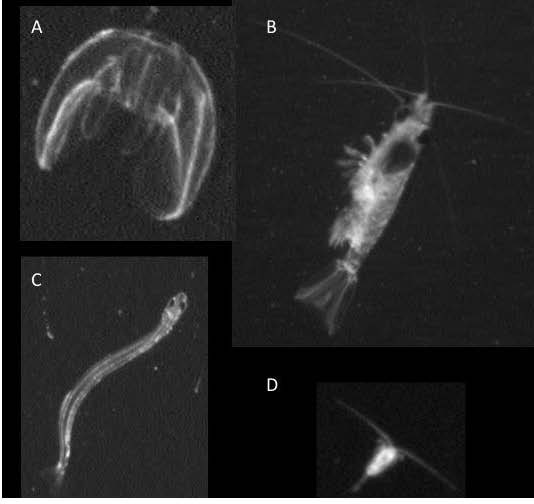 Images captured by the Video Plankton Recorder (VPR): comb jelly (A), krill (B), Atlantic herring larvae (C), and copepod (D). 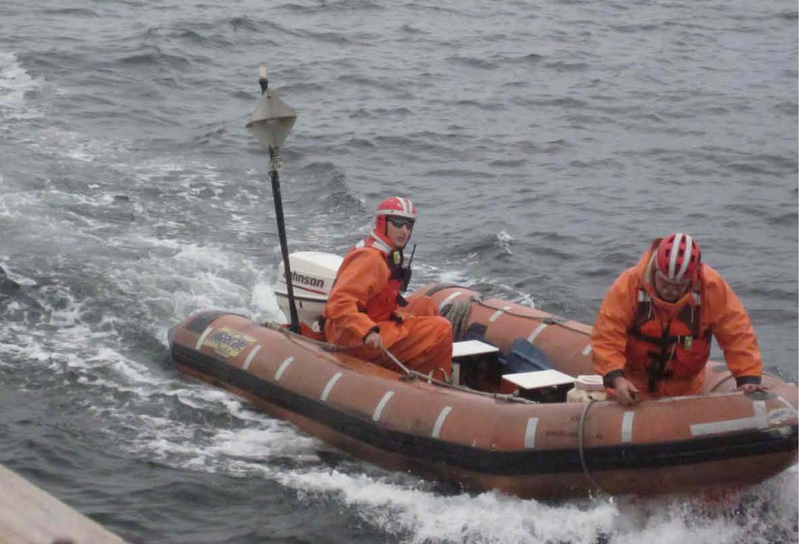 Using multiple types of nets or advanced sampling instruments to collect plankton information on a cruise allows researchers to better understand the entire plankton community. After completing the high priority plankton stations for our cruise, the ship shifted to buoy rescue mode. The drifting Northeastern Regional Association of Coastal Ocean Observing Systems (NERACOOS) buoy was north of us in Jordan Basin. The ship arrived at the buoy just after midnight December 5, and the crew was able to secure it onboard after a few hours work. 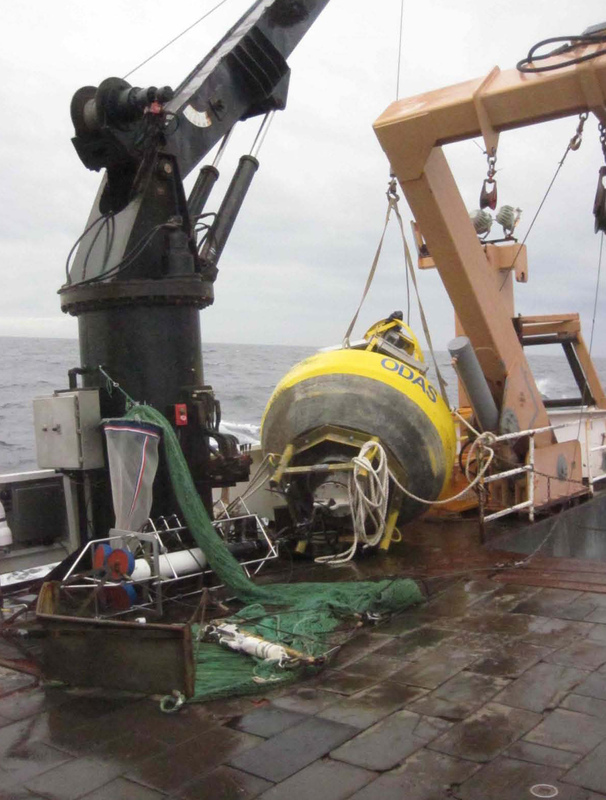 They have deployed and retrieved these buoys in the past, but had to devise a new strategy for this one since we had an extra winch on the back deck to conduct Isaacs-Kidd midwater trawl (IKMT) tows. The back deck of the Delaware II seems spacious until you drop a fourteen-foot buoy with an instrument cage attached in the middle of your gear! During a buoy maintenance cruise they are able to store three of these on the deck. 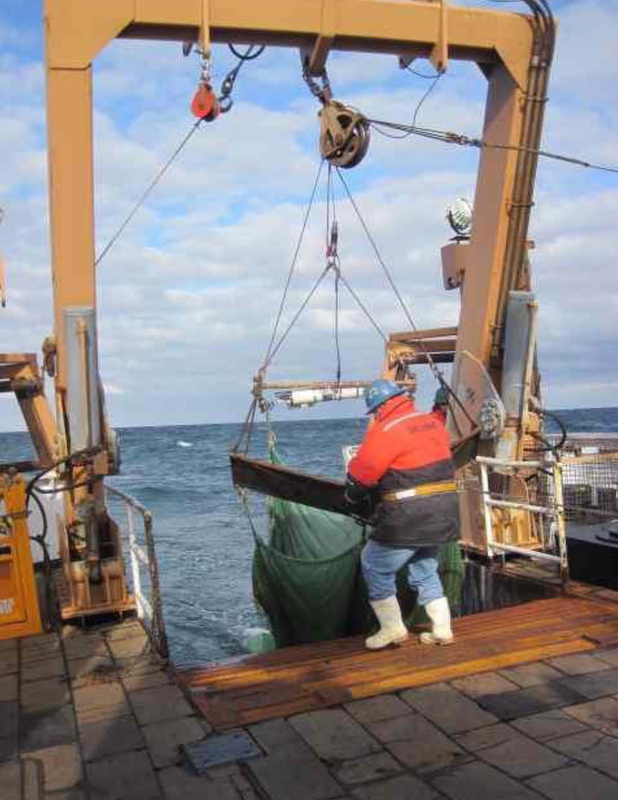 However, we planned to continue plankton work and needed the space for the IKMT. On the transit back towards shore, the buoy was power washed and secured out of the way of plankton operations. We arrived off the coast of Portsmouth and resumed plankton operations just over 24 hours after the last bongo net came onboard. The Delaware II sailed Wednesday, November 30, on the DE 11-10 Ecosystem Processes Research Cruise. The principal objective of the cruise is to locate and quantify concentrations of larval and juvenile fish. The target species for this trip is Atlantic herring, which spawn on Georges Bank in the fall. Sampling will be done primarily with a Bongo Net and a Video Plankton Recorder (VPR) towed simultaneously, and an Isaacs-Kidd midwater trawl (IKMT). The bongo net collects zooplankton and larval fish, and the takes pictures of plankton as it is towed through the water. 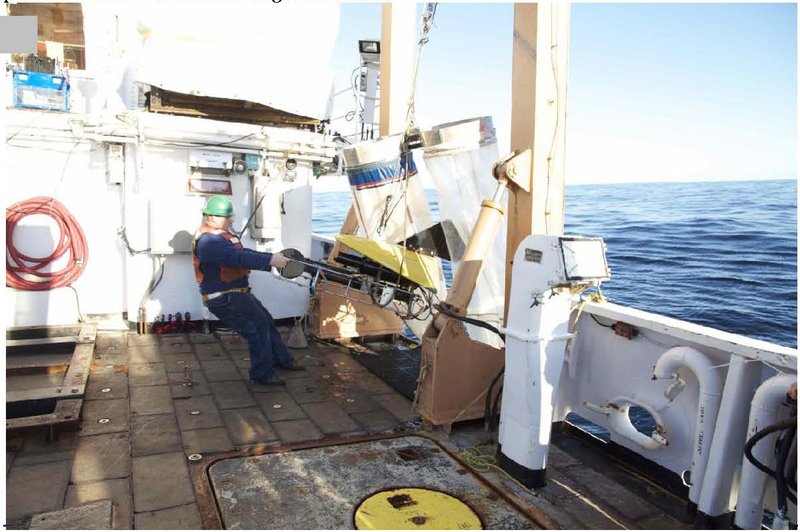 Sampling will be conducted in the western Gulf of Maine, southern New England waters, and adjacent to three drifters released on Georges Bank near larval Atlantic herring collections made during the November EcoMon cruise (DE 11-09). In addition, we are trying to accommodate several other missions during our cruise. 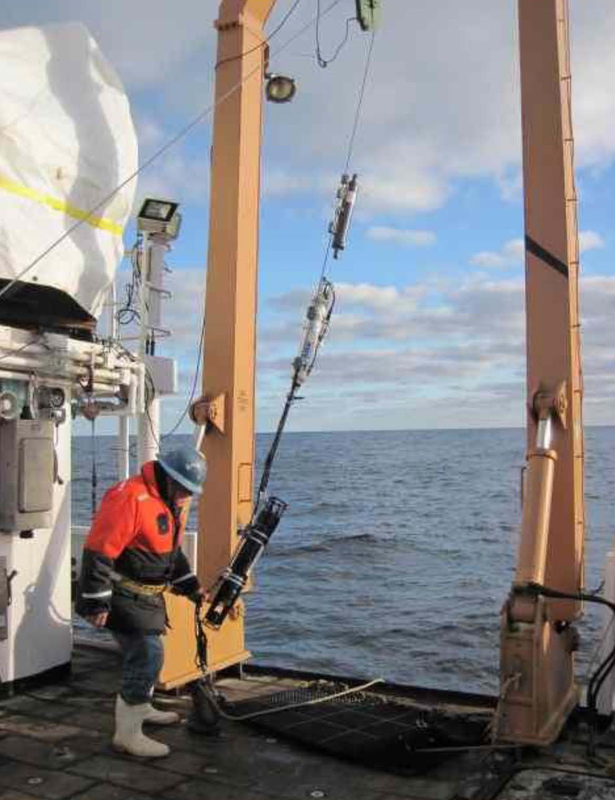 We will conduct vertical casts with a Conductivity Temperature Depth (CTD) probe, a Laser In Situ Scattering Transmissometer (LISST), and Niskin water bottle. The CTD relays real-time salinity (derived from conductivity), temperature, and depth back to the ship. The depth is the most important; it allows us to monitor where our gear is during the tow. We have CTDs on the wire during Bongo and IKMT tows, as well. The LISST collects particle-size distribution profiles, which can be used to monitor how much plankton is in the water column. The water bottle collects water samples for a Fluoroprobe designed to estimate the amount and types of phytoplankton in the water. 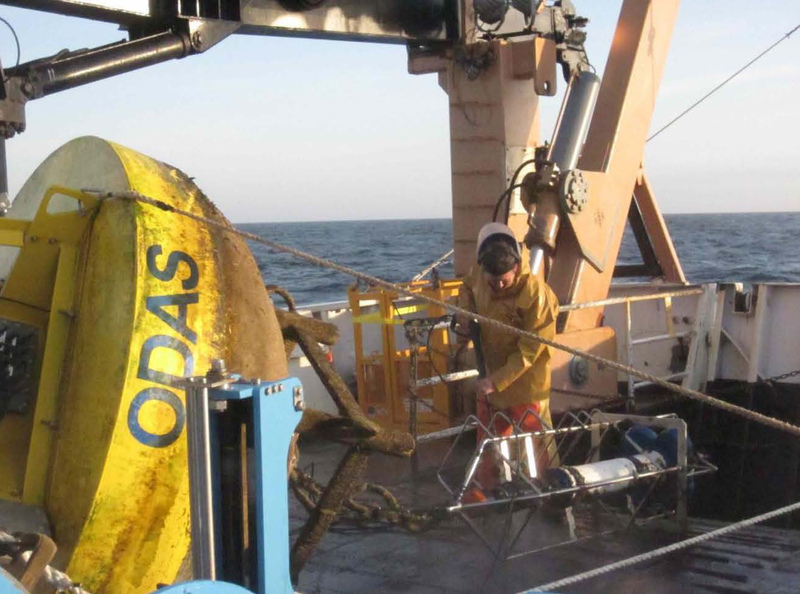 Prior to sailing, we were asked to retrieve a Northeastern Regional Association of Coastal Ocean Observing Systems (NERACOOS) buoy that was drifting in the vicinity of Jordan Basin. We also plan to conduct visual survey transects for sea birds in conjunction with an ACROBAT towed sensor body, which collects temperature, salinity, turbidity, chlorophyll, light, nitrate, and oxygen level data. The transects are located adjacent to Nantucket Shoals, an area of high concentrations of sea ducks this time of year. If the weather cooperates, we hope to accomplish all our missions.